This is a partial preview. Full document is 20 slides. View large preview. 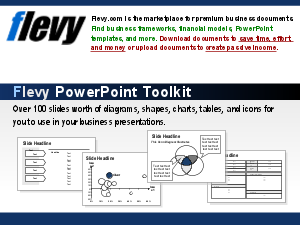 This PowerPoint deck introduces the seven most commonly used storyline patterns in business and explains how to transform each one into a PowerPoint deck of its own. Based on the Pyramid Principle, each of these seven patterns help you clarify your thinking around an important business issue so you can communicate it clearly. While useful on its own, it is designed to accompany the templates for the patterns it describes, which are also available on Flevy. Presentation Development? Bain Presentations? Channel Distribution Strategy Example? Or something else.